I saw one of the talk shows that asked why we can't talk about race, racism, etc. openly, honestly. It's because, as one guest put it, there is a lot of SHAME in our history regarding race and race relations. It's like having someone bring up some embarrassing, inappropriate thing one of your relatives did that you'd just as soon forget about. There is nothing that can be done about our past...we have to find a way to get past it. As with any hurt, it is definitely hard to get past it. Some people find that their religion helps, others hold on to it, and still others find food, drugs, revenge, etc. as ways to manage it. Others mask hurt or cover it up with denial. There is no solution that will eliminate it completely. There is a good article I read in my local paper that mentions how the media is attempting to deal with the hurt by showing an integrated America. I admit, these images do make me feel better about the America we live in. I then have to ask myself, am I allowing myself to become deluded? I'm not sure. I think that's a perfect comparison. 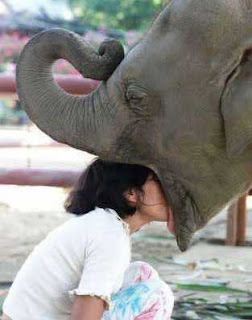 Funny, since I just read that story to my son the other day (the elephant). I imagine I have been guilty on both sides. I have trouble not getting angry or hurt when discussing Native issues, and I tend to set out to convince people, rather than to hear another side. I do try to control that, but whether I succeed is a different story. I want to understand why people think the way they do, but I also want to fix the ills, and I'm too passionate a person to keep it under wraps sometimes.